One of my absolutely favorite things in the whole world (aside from talking to you and spending time with my husband) is discovering new exotic ingredients to get obsessed with. Tahini. Gochujang. Coconut Milk. White Miso Paste. Sriracha. A couple weeks ago it was Vadouvan (which I didn’t even have, I just kind of adlibbed to create my own garlicky, shalloty, curry spice mixture that mimicked it. Yum!!). I take these new ingredients and I go totally crazy, using them in sweet applications and savory applications and for breakfast and for dinner and just everything until I begin to understand their beauty and complexities. Ah! It’s just my very favorite thing! People in the foodie world have been talking about za’atar (and sumac, which is the the main ingredient in this incredible spice blend) for a couple years I think. Since Ottolenghi came out with his first cookbook probably. (I know. I know. It’s like I’m speaking another language right now. Sorry!) Za’atar and sumac kept popping up in my bon appetit magazine and the Smitten Kitchen blog and I just felt so dense because I had no idea what it was or where to buy it or how to use it. 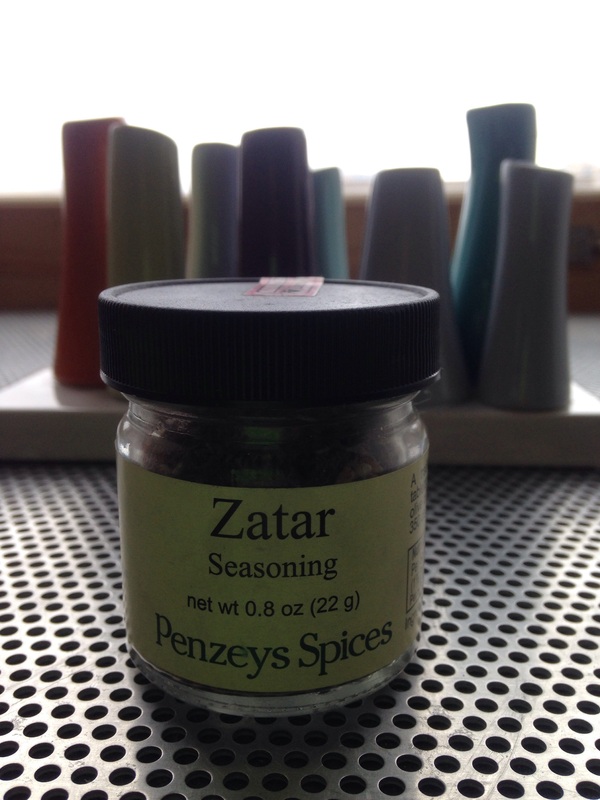 I actually got my first za’atar spice blend (spelled zatar) for Christmas last year from my beautiful cousin Jenny. It was one of 5 things she got me from Penzeys, all of which I for some reason neglected to read over in full detail until this winter because they looked kind of exotic and intimidating (see, even people who cook every day still get intimidated!). It was only when I looked in more detail that I realized my zatar from Penzeys was the same za’atar everyone had been raving about! Sumac, thyme, sesame seeds and salt. That’s not too scary. My very first experiment with this spice was a wild success. Thus why there is no photographic evidence of my yummies and instead these silly afterthought photos taken at my office. I literally ate the first batch up immediately. Before anyone had a chance to even think about snapping a picture. Oops. Then I made them a second time and put them on flatbread with ricotta and black beans. And remembered to take at least a couple pictures before devouring. But this can all attest to their absolute deliciousness!! Right?! Preheat the oven to 400 degrees. Oil a baking sheet with 2 tablespoons of the oil. 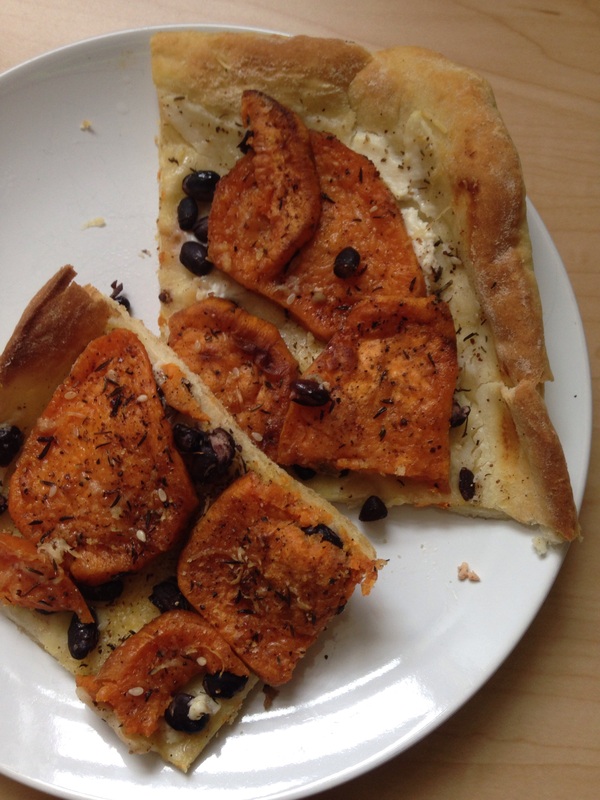 If you want to make the pizza in the top photo just buy (or make) some pizza dough, bake it for 8 minutes, put a good spread of ricotta on the half-baked crust, sprinkle some black beans on top and then the spiced sweet potato chips (and maybe a little extra salt or zatar or both). Add shredded Parmesan to your liking and then bake 8-10 minutes longer until crust is golden brown.